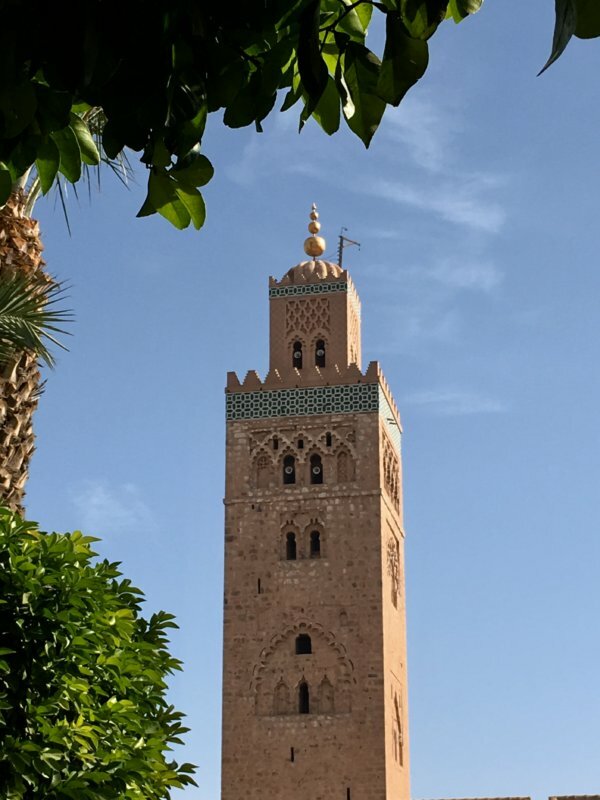 After returning from Morocco I made a list on the top things to do in Marrakech. Trying to charm snakes is not what you should do but there are things like fairytale palaces, noisy souks, quiet parks and pink mosques that I’m sure you would like to see. I will show you those places. Morocco is developing its tourism. Visitor numbers are increasing and new flight connections established, like the new Norwegian Airlines flight from Helsinki I was using. So why not try Morocco if you haven’t been there before? It’s about the same distance from Europe as the Canary Islands. But it is very different, Morocco is a part of the Sahara and Africa and a Berber and Arab country. Marrakech is the city that gave its name to Morocco. It is a pink city in the middle of the desert and it all looks best in evening light. Evening sun gives the pink a magic shade. But there’s nothing wrong with Marrakech mornings, afternoons and nights either. So let’s go and see what there is to do in Marrakech. Marrakech is located in the heart of Morocco, in the desert between the Atlas mountains and the Atlantic coast. You can see the location of Marrakech on the map if you zoom out my map a little bit. It’s a fairly big city with a population of just over a million. The best time to travel are the winter months when the day temperature is mainly between 20-25 centigrade (about 28 in early November when I was visiting). Summers are a too hot time to visit as it can get up to +45. I marked Marrakech sights on the map. I also made a driving route between them so you know the distances. And so we landed in the desert country. A golden desert with palms, that’s what Morocco is like and so is the Marrakech Menara airport. As I travel a certain amount a year I don’t normally pay any attention to airports, the only thing that interests me is to find the exit. I just want to leave behind the airport and get to the city I came for. But Marrakech Menara airport made me stop. I just had to look at it, and look at it again. This airport is a real masterpiece of architecture! This brand-new airport building was opened in 2016 to meet the needs of Morocco’s growing tourism. Ten million tourists travel to Morocco each year of which 5 million visit Marrakech, Morocco’s number one destination. And 5 million Moroccans live abroad so there are travel needs both ways. This sign shows you the airport name in three languages. Due to Morocco’s French history the French language is widely spoken in Morocco, and a lot more than English. Then there is Arabic (the upper text), the official language of the country. And then just a few years ago one of the Berber languages was named Morocco’s second official language. The middle text is in this Berber language. Morocco’s population is 60 per cent Berber and the rest are Arabs, black Africans and other folk groups. Are these window washers Arabs or Berbers? Doesn’t matter, they are Moroccans. And they certainly have a lot to do today. The airport building has a huge amount of window glass and it all is crystal-clear. Unlike my airplane window that you will see at the end of this post. But that’s the departure, and at this point we are entering the country. Having the last glance at the arrivals hall and now on – to the city! The airport is 6 km outside the city . On the way to the city you will see the Menara Gardens, so why not stop right there and walk a little bit after the long flight? The Menara garden is not from 2016 like the airport, no, it’s hundreds of years older, from the 12th century. There is a huge artificial lake in the middle that gets its water from the Atlas mountains through an underground tunnel. The water makes the garden look like an oasis in the desert. But no souvenirs, camel rides or roasted nuts for me this time, even if this sign probably tries to get me buy them. It’s a beautiful sign that contains some information I don’t get. But I get the olive trees and there are thousands of them. The watering system enables growing olive trees around the basin, in a total area of 90 ha. It’s a walled 90 ha and a popular park for the locals. And those Moroccan olives are so good, I have tried them many times. This the biggest mosque in Marrakech and very much worth a visit, even when non-Muslims are not permitted in. But you can look at the mosque from the outside and walk around it. And wonder where the booksellers are. There’s just one stall selling drinks, nuts and souvenirs in front and some more on the sides but no book stalls anywhere. But when they built the holy building there where 100 booksellers around. – So when did they build it? The ruling sultan started in 1147 and his grandson completed. So it took some years. Now there is a park instead of bookstores, the Koutobia Gardens, with fountains and orange trees. But these are not just any orange trees, they make sour bitter oranges of which the Chanel 5 perfumes are produced. Maybe the sign below tells you that. I heard it from my Marrakech tour guide. It was a hot November day but still below 30 so there was no need for a sun so the seller had gone away. But he will definitely get his caps sold in summer. The Koutobia minaret is 70 m high. It’s the highest building in the city. And pink like everything else is in Marrakech. Five times a day they will send prayer calls from the top to tell Muslims it’s time to pray. The times are connected to sunrise, sunset and other times of the day. That means the times are different every day. Just like in other Muslim countries in Morocco they alternatively check out the proper times in the daily paper or download an app for that. Koutobia souvenir stall from behind. Clever! These women are entering the mosque. But as we were not allowed in we didn’t follow them in. Instead we entered a fairy tale palace, Bahia. The Bahia Palace is a new one compared to any other Marrakech palace. Two viziers built it in the 19th century and one them then used it has his harem. Bahia means beautiful and that’s what the palace is. They employed Morocco’s best artisans for 14 years in a row. The tiled floors and made lace-like ornaments. The Bahia Palace has 150 rooms. It’s used by the Moroccan Royals. Tourists only have access to a part of the palace but who could walk through all 150 rooms? Look at the floor and wall tile work. That makes me think about Sevilla and Granada. And the carvings look just like the ones in Alhambra. Morocco has had a Spanish influence and the other way. This photo shows a corner of a riad, courtyard that there are many. They all have a small garden, fountains in the middle and rooms on the sides. This building style is typical of Morocco and good in a hot climate. Some more decoration: painted cedar wood ceilings that exist in many of the halls. Cedar wood grows in the Atlas mountains and the tiles again come from Tetouan. The Bahia Palace is right in the middle of the Mellah, the old Jewish quarter. Morocco was located on the most important trade routes so many nationalities found their way to Marrakech. There has also been a large Jewish community but most Jews then moved to Israel. Today the Mellah is the kind of noisy, busy, crowded area you can expect to see in Marrakech. Narrow streets, shops and bazaars – and traffic jams. All kinds of vehicles and loads of transport. This is Morocco and no other country. In Morocco people normally go home for lunch. They have long lunch breaks in the afternoon. Even school children return home. Women stay at home and prepare the meals. Today this is of course changing as more women work outside their homes. You can see both traditionally and European dressed women in Marrakech, but maybe traditional clothing still is more common. Here you can see pink Marrakech houses again. That comes from the building material. Bricks are made of local mud and stone and they give the color. We will now make a side trip to the Majorelle Gardens at the north end of the city center and return to the old city afterwards. 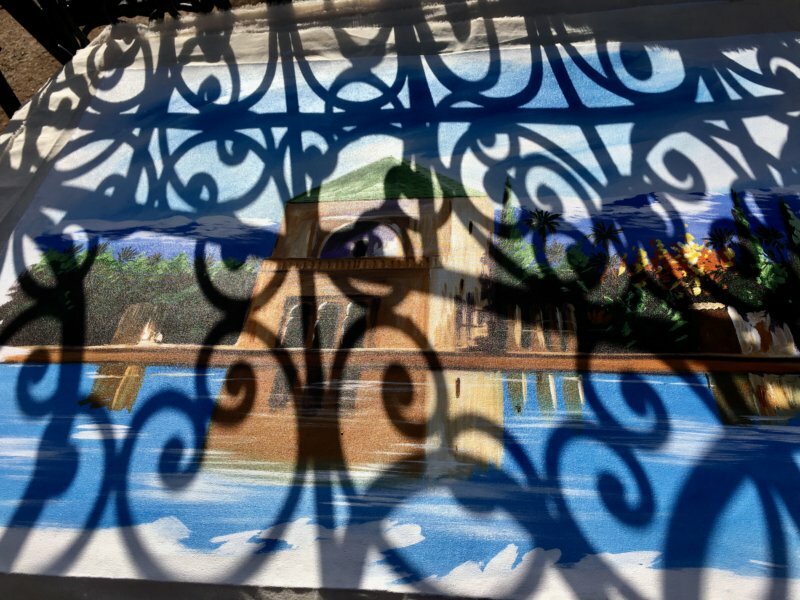 The French painter Jacques Majorelle built his gardens in the 1920s when moved to Marrakech. He loved the intensive African light. Majorelle planted tropical palms, bamboo and flowers. He also built a watering system to keep his plants alive. And he made walkways around the garden. Jacques Majorelle built a blue villa and a cactus park and pools around it. After he died Yves Saint Laurent who also had fallen in love with Morocco came and bought the house and the park. He carefully restored them. Yves Saint Laurent lived here with his partner Pierre Bergé who was an industrialist. He helped Yves make his fashion a worldwide brand. Today we can enjoy both his brand and his house down in Morocco. Yves then died and Pierre Bergé after him in September 2017. Did you know that Yves Saint Laurent created Love cards that he sent out each year? These cards exist as posters. You can see them in a garden building. When it’s getting dark in the gardens it’s time to go and see the souks that will be waking up by this time. I want to see the souks! And yes, it’s busy! It’s so hard to keep together with my group and easy to get lost in the jungle of narrow alleys and tunnels, surrounded by people rushing in all directions. 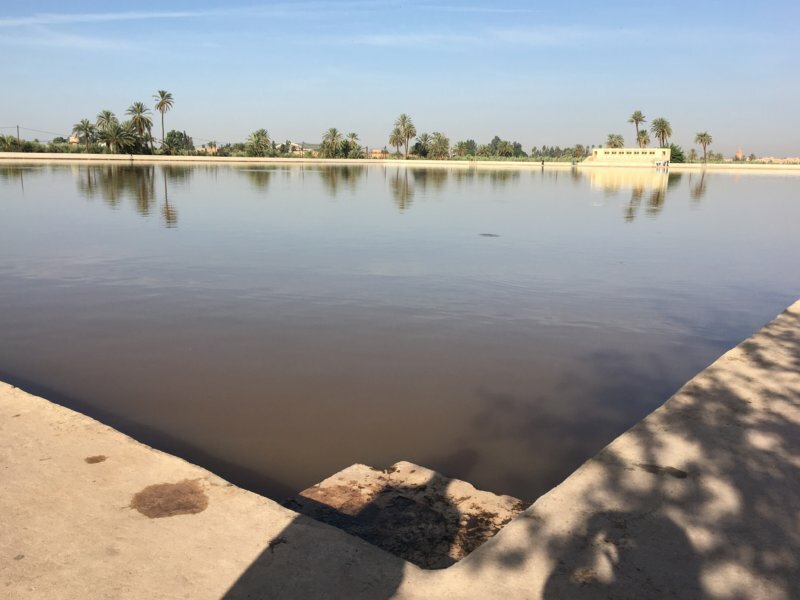 We were touring Marrakech on a minibus tour but here we had to leave the bus. The only way to explore the souks is on foot (or by bike or pushing a overloaded handcart). The souks are arranged in the way that shops selling the same kind of products are grouped together. So there is a carpet souk, a metalwork souk, a basket souk, a clothing souk and a leather workers souk. What I liked most was the beautiful Moroccan carpets. But as I travel without checked-in baggage I firmly have to close my eyes even if it’s very hard for me. But nothing can prevent me from looking around and taking photos of the things I like. I want to remember what I saw in the souks. Carpets line the walls and lie in huge stacks on the floor – and each carpet is different. There are city carpets and country carpets and all of them tell the story of the family that made it. Wish I could bring home a Moroccan carpet or two. Some more photos on what was being sold along those narrow alleys. Most products were well arranged and piled while others were chaotically hanged in the corridors so it was hard to pass through. What made me happy was that the sellers were nice, they were not aggressive nor running after me if I didn’t show any interest in their products. . But of course when you want to buy something you need to haggle and discuss the price more than you are used to do at home. There are no fixed prices in the souks. The souks so interesting and tell so much about the country itself that I made a separate post on Marrakech souks. The Square of Jemaa el-Fna is the center of the souks of Marrakech and it’s the center of street life where it all happens. Jemaa el-Fna has street sellers, a lot of them. And there are many others as well like all kinds of fortune tellers, snake charmers, acrobats and other showmen, and pickpockets so stay close to your group if you have one. Be prepared to pay for any photos you take of the performers. You really need to have dirhams in small coins in your pockets when visiting the famous Jemaa el-Fna. Jemaa el-Fna has been like this for the last 1000 years, since the time when caravans arrived from Sahara with their loads of slaves and spices. It’s a place for gathering and the place that made Marrakech world-famous. All this has been recognized by the UNESCO that took Jemaa el-Fna on their World Heritage list. Jemaa el-Fna keeps the Moroccan heritage alive. So this was my list on the top things to do in Marrakech. These are the most famous sights. If you plan your route in advance you can see all this in one day, for example as a day trip from another Moroccan tourist destination. Hope my article helps you in planning your own Marrakech trip. But of course Marrakech offers a lot more to do and I recommend you stay many days in Marrakech. And one day, who not one day make a day trip from Marrakech, to the coast. Essaouira is a perfect day trip destination from Marrakech. But for this time, good-bye Marrakech and good-bye Morocco! Digging the new look of Marrakech. Great article on Marrakech. I had a chance to visit Morocco a few years ago. But I am sorry to have missed that experience after reading your blog. Would really like to visit Marrakech one day, and I’m sure to make it. There are many beautiful places to visit, most of which are mentioned here. I would like to add Ouzoud Waterfall, Erg Chigaga, Fes and Atlas Mountain to the list. Your photos are beautiful too!The markets look like fun. Thanks.